Rubenerd: I can now boot FreeBSD on my MacBook Pro! I can now boot FreeBSD on my MacBook Pro! Ladies and gentleman, I've done it… I've finally managed to install FreeBSD on its own partition alongside Mac OS X Leopard on my MacBook Pro! 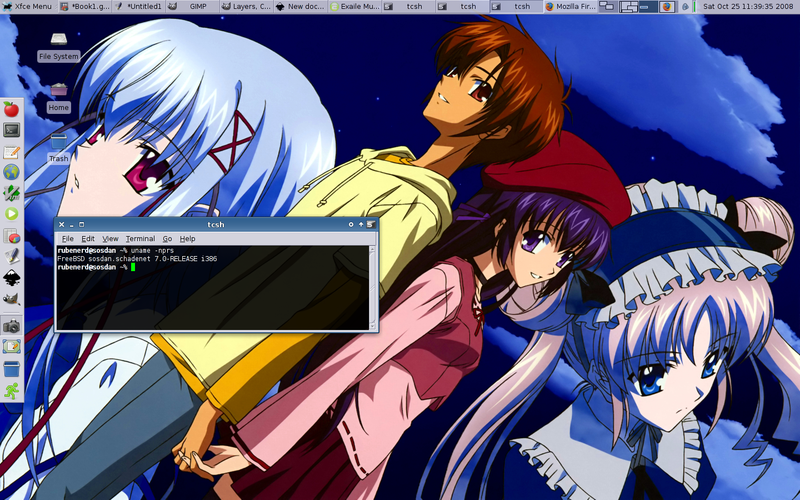 The above screenshot of FreeBSD with the svelte Xfce graphical desktop environment was taken a few minutes ago on said operating system, now I'm typing up this post from Kazehakase, aka 風博士, aka swish alternative Unix-like web browser. ASIDE: I liked that desktop background because I’m hoping to be like that guy one day. If you’ve watched Sola, I don’t mean that as in I want to just be a thought in someone’s mind… just what’s depicted in the picture… right? Right? Ahem, chaning the subject, Sola was a brilliant anime series. One word to describe running FreeBSD natively on an Intel Mac? Smooth! After running FreeBSD in a VMware Fusion virtual machine on my MacBook Pro for several years, this weekend I finally got fed up with waiting for VMware to update their drivers for the 7.x series (and giving us 3D support), so I decided to go this route. Using the Radeon drivers the windows move smoothly and everything renders just as fast as my windows on Leopard do. And so many of my favourite applications (The Gimp, Inkscape, Gnumeric, Vim, Abiword…) all work beautifully, even better than when run in Leopard's X11 environment. In the coming days I'll discuss the steps I took to get here, and any other important pointers I learned along the way. Unfortunately there really isn't much documentation online on how to do this, so it involved a lot of improvisation and messed up partitions.